A dense colony of mealybugs. Mealybugs are common pests of houseplants. They are pink, soft-bodied insects covered with a white, waxy, cottony material. The white “fluff” helps protect them from excessive heat and moisture loss. Unlike their relatives the scales, most species retain their legs throughout their life and can move around. Females are rounded, wingless, and about 1/16″ long. The citrus mealybug (Planococcus citri) is the most common species found on plant foliage. It feeds on a wide variety of plants, and especially likes soft-stemmed and succulent plants such as coleus, fuchsia, croton, jade, poinsettia and cactus. In my greenhouse I also find them consistently on rosemary, citrus, and bird of paradise. 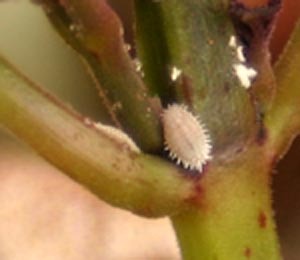 Other mealybug species such as longtailed mealybug (P. longispinus) or cactus mealybug (Hypogeococcus festerianus) occasionally occur on specific host plants. These species remove plants sap from aboveground plant parts, especially stem tips, leaf junctures and new growth. 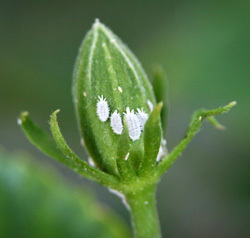 Citrus mealybug, the most common species of mealybug found on houseplants. Their feeding weakens and stunts plants, and causes foliar yellowing, defoliation, wilting and general plant decline. In some cases, plants can be killed. Citrus mealybugs inject a toxin while feeding that causes plant malformation. Mealybugs also excrete honeydew, which allows for the growth of sooty mold. 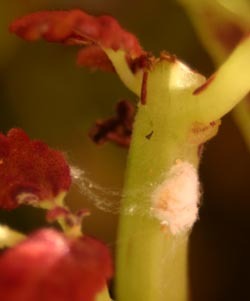 Some mealybugs are root-feeders. The ground mealybug (Rhizoecus falcifer) is the most common soil mealybug, occurring on the roots of many house plants, especially African violets. 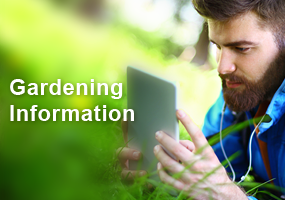 Feeding on the root hairs results in yellowed leaves, wilting, stunting and bloom reduction. A few mealybug species will move to roots when growing conditions are less favorable, but return to stems and leaves when plants are actively growing. 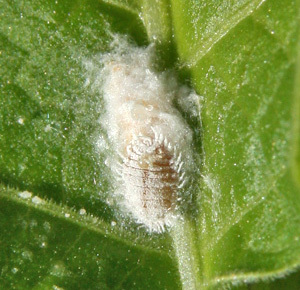 A female mealybug and her cottony egg mass. Female citrus mealybugs lay up to 600 small (1/100 inch or 0.3 mm long), yellow eggs within a protective mass of white, cottony threads. The longtailed mealybug does not lay eggs but produces live young, similar to aphids. 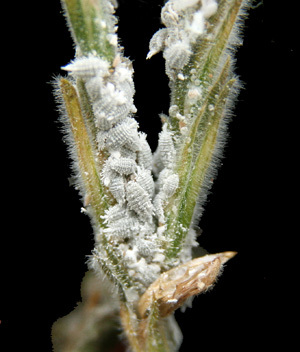 After depositing the egg mass or live young over a period of 5–10 days, the female mealybug dies. The immatures search for feeding sites on which to settle. Male nymphs settle and spin an elongated, white waxy cocoon. Females have three instars and are mobile throughout their lives. Citrus mealybug egg mass with newly hatched nymphs. The best method for detecting infestations of mealybugs on leaves and stems is visual inspection – just looking at the plants. Both the insects themselves and the eggs in their masses of waxy threads may look like white cotton on the plant. On some plants mealybugs concentrate on the growing tips, and on other plants they are more dispersed. The longtailed mealybug frequently conceals itself in leaf whorls. Underground infestations are more difficult to detect. Yellowed or wilting foliage may indicate the presence of mealybugs on the roots. Small white cottony masses around the drainage holes of pots also indicate the presence of mealybugs, but in many cases infestations can be confirmed only by removing the root-ball from the pot to observe mealybugs on the roots. Mealybugs on a hibiscus flower bud. Mealybugs are difficult to get rid of because immatures typically wedge themselves in stem crotches, leaf folds, or other tight locations where washing or pesticides cannot reach them. The best way to control mealybugs on houseplants is to prevent them from being established in the first place. Carefully inspect all new houseplants before introducing them to your home, and keep them separate from other plants for a week or so if possible. Mealybugs can easily crawl from one plant to another, especially when leaves or branches overlap, so one contaminated plant could spread mealybugs to all your houseplants. 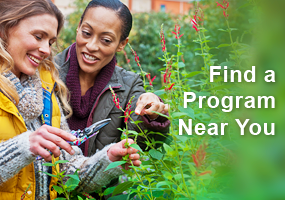 Check under leaves, in new leaf folds, and around the growing tips for signs of infestation. Mealybugs like lush foliage, so avoid over-fertilizing with excess nitrogen. 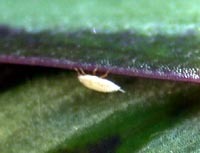 A citrus mealybug nymph crawls along a leaf. If mealybugs are present on only a few, small plants, you can try to reduce or eliminate infestations by washing off the plants. A moderately strong spray of warm water will dislodge most of the mealybugs. Alternatively, you can try wiping the insects and egg masses off the plants with a cotton swab or cloth dipped in rubbing alcohol. This is most effective on large-leaved plants (but test first on a small area to make sure the alcohol won’t damage the plant; it may take a day or two for symptoms to show). Washing rarely eliminates all the pests, so it is important to check the plants periodically and wash again or use other controls when more are noticed. 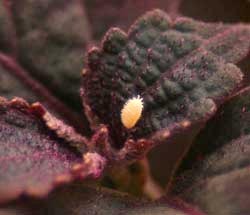 A mealybug crawls on a red coleus plant. It may be helpful to prune out heavily infested plant parts when such pruning won’t damage the appearance of the plant. Dispose of plant cuttings immediately, since mealybugs can survive on detached plant parts for as long as those parts have moisture. Consider discarding a heavily infested plant and replacing it with a new, pest-free plant as one way to deal with a severe mealybug problem. Root infestations are particularly difficult to control, so this is often the most practical way of eliminating root mealybugs. Chemical controls can be used to treat mealybugs. Less toxic alternatives such as insecticidal soap or horticultural oils can be effective, but must be applied to the hard-to-reach places the mealybugs inhabit to kill the insects. These may require several applications to achieve control. 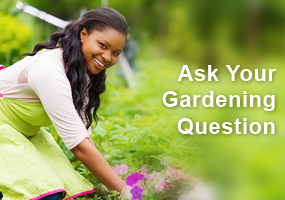 There are several registered insecticides available at garden centers that will control mealybugs. Read the label carefully to make sure the material is effective for mealybugs and for instructions on how to apply the pesticide. A number of natural enemies, including several parasitic wasps and predators, are known to attack mealybugs. Some are used for control of mealybugs in commercial greenhouses, but most are not appropriate for use in the typical home. The mealybug destroyer, Cryptolaemus montrouzieri, is a small lady beetle that is a very effective predator, especially when mealybug numbers are high and many egg masses are present. It can be purchased commercially and should be released at the rate of 2-8 adults per plant. However, it will take some time for the beetles to reduce mealybug populations and may not eliminate it entirely. Well, I now need to inspect some of my houseplants that are starting to have difficulties! I didn’t see any mention of diatomaceous earth in this article or the one on scale insects. Is it an effective treatment? I assume freezing kills mealybug and scale. What would leave very tiny clear drops on the underside of the leaves?